Adventure enthusiasts of the world are always on a lookout for the best places to attempt mountaineering. India is blessed with such incredible landscape that offers the perfect platform to attempt trekking of all kinds of difficulty. However, this article is focused on those brave hearts and professionals who have ample experience in trekking. Housing the world's third largest peak, Kanchenjunga, India has attracted the interest from adventure buffs all over the world. Read about trekking the Kanchenjunga and other such mountains of India that will give you an experience that you shall never forget. Perched at a fearsome height of 8586 m, Kanchenjunga is the third largest peak in the world. The mountain is divided between Sikkim in India and the rest lies in Nepal. It is one of the most sought-after mountaineering destinations in the world. The trek will take an entire month to be completed. You will walk through the forests of Sikkim that are filled with beautiful rhododendrons, while witnessing the most majestic and incredible peaks of your life. Have a life-changing experience by trekking up the Mount Kanchenjunga. Set amidst the Dhauladhar mountain range of Himachal Pradesh, Hanuman Tibba is the highest mountain of all. Also known as The White Mountain, the trek up this mountain is a very strenuous one. Since the mountain is surrounded by magnanimous glaciers, it appears like a white pyramid. This trek takes 17-20 days to be completed, where you will get to see nature in her most pristine form. The best time to undertake this trek is between the months of May to September. Kamet is the second largest mountain of the Garhwal region in Uttarakhand. Set at a height of 7756 m, Kamet appears as a giant pyramid with a flat summit that consists of 2 peaks. Although the ascent is straightforward, it takes an entire month to be completed. The best time to go on this expedition is during May, June, September and October months when the weather is not harsh. Since the highest peak of the Garhwal region is Nanda Devi and most of the limelight falls on that region, trekking on the Kamet mountain is an offbeat experience. Mount Rathong is perched at an altitude of 6678 m and is the place where the Rathong Glacier is found. Trekking on the Rathong Glacier is a very thrilling adventure that must be experienced as soon as possible, since global warming is rapidly melting the Rathong Glacier. Usually, the trek to the Rathong Glacier is coupled with a trek to the famous mountain pass of Sikkim, Goecha La. 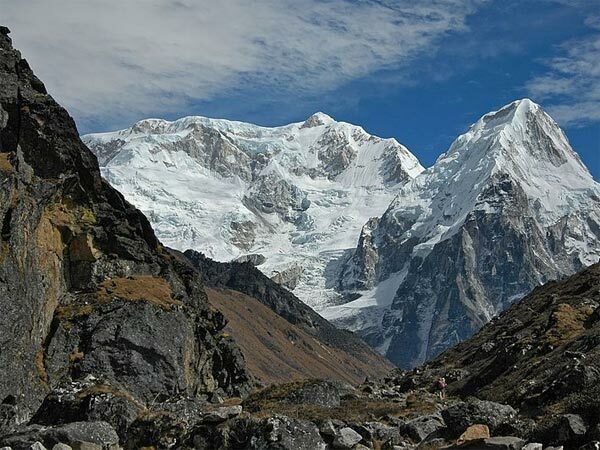 The trek to Goecha La is one of the most sought-after adventures by adventure buffs of the world. One of the most rewarding treks of Garhwal ranges, apart from Kamet and Nanda Devi, is the trek up the Changabang mountain, that is perched at a height of 6866 m. Wide moraine meadows, fantastic biodiversity, Bagini Glacier and a breathtaking view of the two peaks of Kamet and Nanda Devi is something you can expect from this strenuous trek. The trek to Changabang base camp will take 9-12 days to be completed. Add a few more days if you want to reach the Changabang summit. While these treks are clearly for the professional trekkers who have plenty of experience in trekking, it is important to get a medical check-up before taking up any of these treks. Make sure you have all the necessary permits and paperworks to make some of these treks. Always go with a group instead of going on an expedition solo. Keep the trail clean and carry the trash back to your base camp. Carry along a proper medical kit and learn how to use it efficiently before you embark on any of these treks.